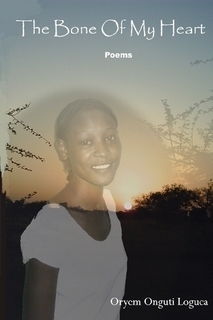 Southern Sudanese Creative Writers, By Abdalla Keri Wani. Juba's Gala Nights, by John Oryem. Preface from Santino Fardol's "Southern Sudan and its Fight for Freedom"
See our newest release, "Talking Things. Please let us know if you'd like to help with marketing. By ORYEM ONGUTI LOGUCA. From Night Visitors... The tree trunks were wet, his tiny hands trying to slip; sweat kept on gushing out from all over his body. He allowed himself to be suspended by his toes. Even his naked belly grew claws to cling hard on the tamarind branches. The vultures above pitied him as he looked like a preying python in a veld. The birds were used to gunshot sounds; they always rushed to the battle scenes undisturbed. Death was feasting time. The boy’s testes sunk deep inside his body. The hard, uncompromising bark of the tamarind tree scratched his buttocks; he never felt any pain, perhaps ignoring it for life’s continuity. His breath and heartbeats competing for recognition. By ORYEM ONGUTI LOGUCA. 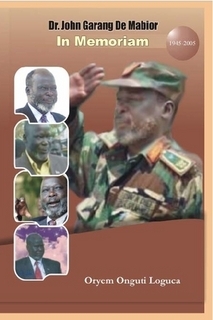 The memories of Dr. John Garang will be immortalized by anyone who had known what he fought for in his lifetime; culminating in a helicopter crash on 30th July 2005. That crash, which he never survived, took his physical flesh. Humanity will continue to drink his vision and legacy at a high rate, leaving those still thirsty to know him well, being stranded at the shelves of knowledge to further seek to know, John Garang, the human being. A sheer fact of his dedication to his cause and quest of his people who had suffered for generations shouldn’t be left to rot. It should be documented for posterity. Foreword by Steven Wöndu, Sudanese Ambassador to Japan. 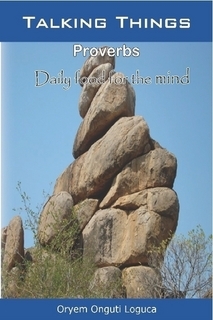 This simple collection is meant to colour our daily talks, conversations and pass on some of the relevant proverbs to our children at school, workplace, churches and public places. Using proverbs in our lives does not indicate we are outdated or unaware of current events and bound to antiquities. Spicing our talks with proverbs pays abundantly. Our well-known motivational speakers use proverbs frequently in their speeches to hook up with their audiences. Can you be one after reading this short book? By ORYEM ONGUTI LOGUCA. Whatever is portrayed in this work, one can look into our daily mirror of life, which we shall, indeed share, because of our common origin and appreciation of life. In the midst of all our sufferings, life ought to be carried on. Those who sing the dirges of such traumatized nations are; orphans, widows, refugees, disabled, AIDS victims and the displaced. From the street corners, refugee camps, funeral homes, bus stations, market squares, and deserted villages, we shall sing our songs, on our own behalf and for our ancestors who are long gone before us. If we can fix ourselves in these few pages of The Bone Of My Heart, let us do it! 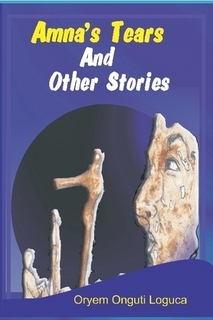 Supported by World Writers Resources, Inc.